This beautifully 2018 decorated condo is set in a peaceful private setting amongst the natural beauty of Anna Maria island and only a short walk from the 7 miles of stunning white beaches. The fully air conditioned condo overlooks the private pool and has been completely redecorated in 2018 and includes everything needed to make your stay as memorable as possible. The spacious tiled lounge includes 2 leather sofas, 6 seater dining table, 49 inch flat screen smart TV with added cable, ipod player and free high speed Wi-Fi. The kitchen has been completely refurbished with new units and beautiful granite worktops. A new range cooker, fridge freezer with ice maker, microwave and washer dryer have also been installed. In addition a kettle, coffemaker and toaster are also included along with all cooking utensils to make your stay as convenient as possible. The master bedroom has a new queen sized bed, new furniture, Flat screen TV and recently added Pergo laminate flooring. A new vanity unit with granite worktop have also just been installed. A new en suite shower and bathroom provides added convenience. The second bedroom includes 2 new full sized beds, new furniture, new laminate flooring and a 32 inch TV. The master bathroom includes a bath with shower facilities. The screened lanai / balcony overlooks the pool and has had new tiles added and with the addition of furniture is the perfect place to sit and relax. The heated private pool is accessed through a locked gate and is for the sole use of the owners and renters of the condos. New tiles and furniture have been added recently making this a wonderful place to relax and soak up the sun. All linen, towels, beach towels are provided. In the carport we have a locked cupboard where you have the use of beach chairs, fishing rods and a barbeque. Parking for 2 cars is available in the private car port. If you choose to leave the car we are situated just a short walk from the nearest bus stop. The free trolley bus travels around the island stopping at all the shops and amenities. There are 2 fishing piers nearby where the locals love to teach you how to fish. For the active ones you will find plenty of water sports nearby, jet skiing and numerous public golf courses are a short drive away. Disney is a 2 hour drive and Busch Gardens and Tampa Airport 1 hour. Table with seating for 4 people. A number of public courses are located within a short drive. The condo is very spacious with lots of room that will be ideal for a family of 4. The balcony is screened and is south facing so the sun is there all day and into the late evening which is fabulous to watch the sunsets. Enjoyed our stay in this lovely, spacious and well appointed condo with a large screened balcony. The pool area was very inviting and the water temperature perfect for a dip. The owner and manager were easy to work with for our vacation. The location was ideal for us with plenty of shopping, restaurants and of course the beach, within easy walking distance. We would certainly stay here again in the future. Thanks Barbara for taking the time to write such a nice review. I’m delighted you enjoyed your stay at our condo and would be more than happy to accommodate you in the future. The condo is a great choice for an Anna Maria Island vacation. Well equipped, quiet, nice pool, and a short walk to the beach. What else can you ask for? Jo, we had a wonderful time visiting with family and friends and couldn't have asked for a better "home base". The teens enjoyed the pool, but especially liked the freedom of being able to walk to the store and the beach. We found everything we needed to make our stay comfortable. When next we head south we would be glad to stay at your property again. Thanks for all! The location was in the middle and close to everything. Owner was responsive to emails and questions. It was very easy. The property is perfect in terms of space, style and location. We stayed here with our 7 year old daughter who lived in the immaculately clean pool. Its a five minute walk to the beach and a five minute walk to Publix. The development is very well maintained and is quiet and tranquil. We had a wonderful time here and highly recommend this property to anyone looking for a relaxing break. You don't need a car to get around the island as the trolley stops right by the property. Thanks Dara for the great review. It was a pleasure having you stay in the condo and we would welcome you and your family back at anytime. We enjoyed our stay in this excellent property. It was within walking distance to the free trolley and grocery store. The grounds were well maintained and the pool was warm and clean. We look forward to returning to this property. Thank you for taking the time to write the lovely review on our condo. It was a pleasure having you rent and we welcome you back at any time in the future. 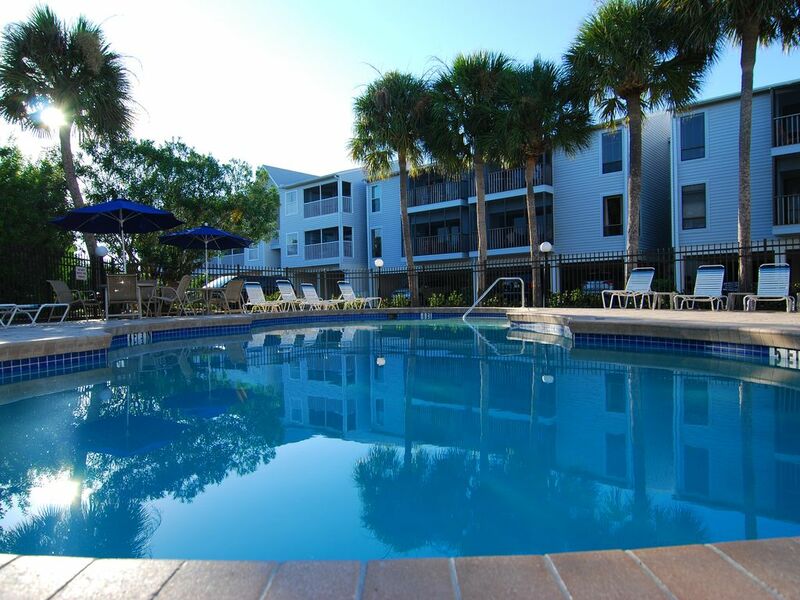 Situated just 5 minutes walk from beautiful white sandy beaches on Anna Maria Island. Disney is just 2 hour drive and Busch Gardens only 1 hour. Nearby towns/cities are Sarasota and Bradenton. There is a $75.00 charge for cleaning the vacated property, $100.00 for monthly bookings The damage deposit is $300.00 for weekly bookings ( $500.00 Monthly ) which is fully refunded within 7 days of you returning from your vacation.